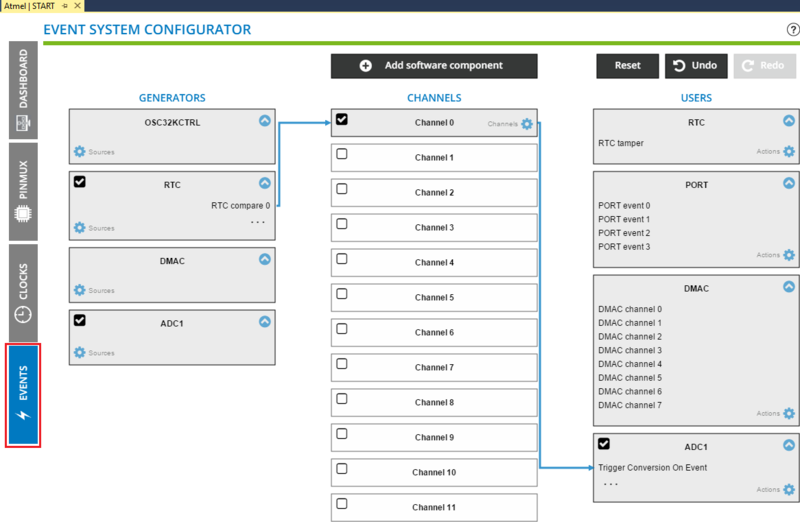 The RTC is configured to provide an event to ADC for every one second. 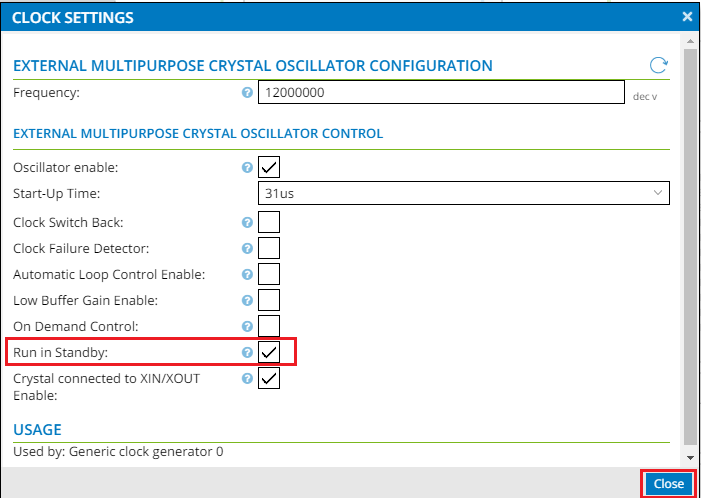 Click on 'TIMER_0' to make a configuration window appear at the bottom. Enables timer hardware abstraction layer driver. Timer is configured as real time counter (RTC). RTC clock is sourced from 32 kHz ultra-low power internal oscillator. Enabling this clears previous power down data available in RTC. The RTC 32 kHz clock is used, no need for division. Compare value is equal to RTC source clock multiplied by time (32.77 k * 1000 ms = 32770). 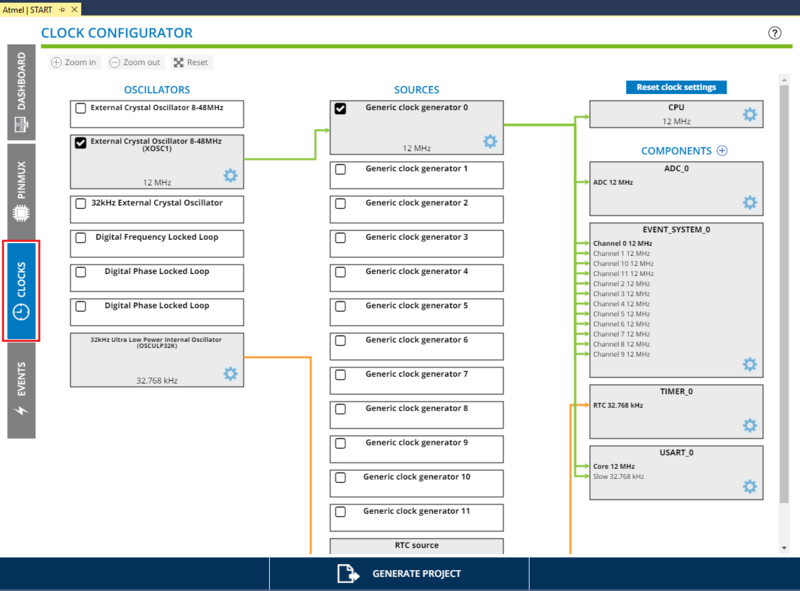 Configure the ADC instance to convert the I/O1 Xplained Pro board's light sensor from analog value to digital. 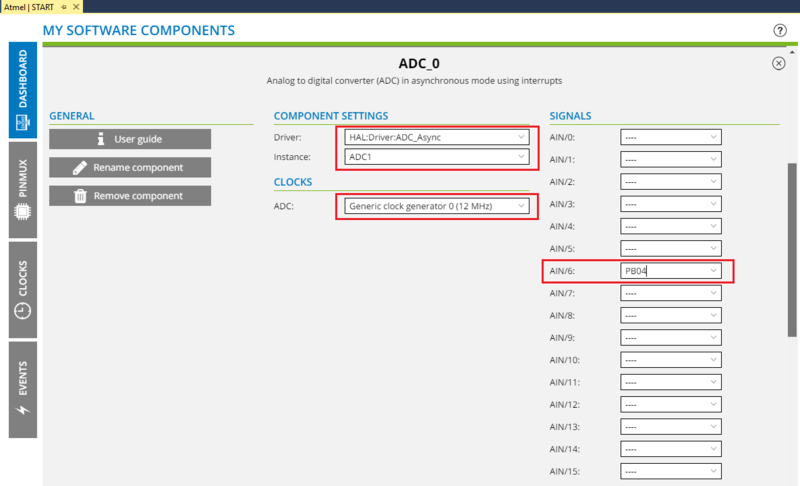 Click on 'ADC_0' to make a configuration window appear at the bottom. The light sensor is connected to PIN3 of the I/O1 Xplained Pro board and the board is connected to Extension Header 1 (EXT1) of the SAME54 Xplained pro board. EXT1 header PIN3 is connected to ADC1/AIN (PB04) of ATSAME54P20A IC. Hence, you will configure ADC for this pin. 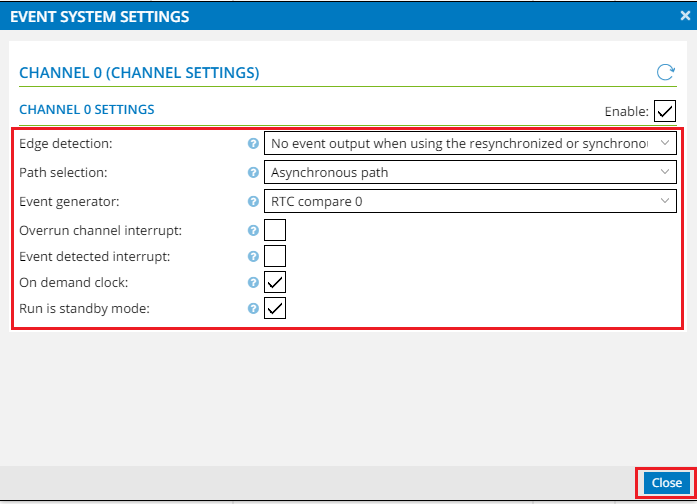 ADC must be used through an asynchronous path as it will be started by the RTC event. It returns immediately, even if the requested number of data is not available. Since the event system is monitoring the ADC Result register, there is no scope of the application to wait for until the ADC data is available. The system can be in sleep mode until the ADC data available event system automatically moves the result to the UART RX register. The signal to convert is the one coming from the light sensor located on the I/O1 Xplained Pro extension on the PIN3 as described in the I/O1 Xplained Pro user's guide. Conversion result is set to '8-bit' to get one byte value varying from 0x00 to 0xFF. Analog reference voltage is set to 'VDDANA' because the light sensor operates between 0 to 3.3 volts. ADC is configured to operate at 3 MHz to start conversion (i.e., Peripheral clock / 4 => 12 M/4 = 3 MHz). The peripheral will run in standby mode and will be able to respond to events even with the device in sleep mode. Device will be in sleep mode and the clock is enabled on demand whenever necessary. The USART is configured to display the light sensor values on serial terminal. 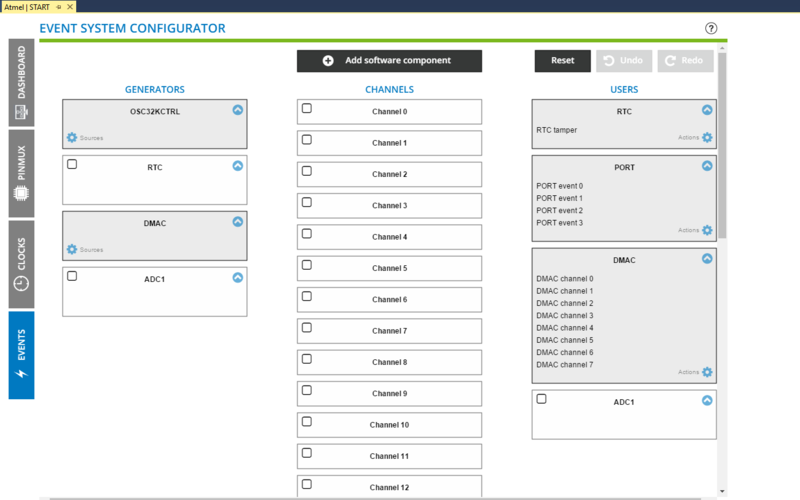 Click on the 'USART_0' instance to make a configuration window appear at the bottom. USART synchronous driver configured to transfer light data to the serial port. The SAME54 Xplained pro board's virtual com port uses SERCOM2. The SAME54 Xplained pro board receiver pin of the virtual com port is connected to PB24. The SAME54 Xplained pro board transmitter pin of virtual com port is connected to PB25. 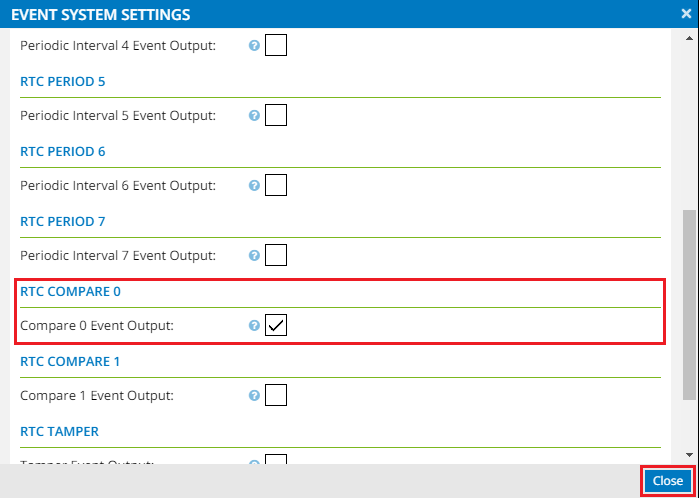 The 'Event System' is configured to trigger events without CPU intervention. 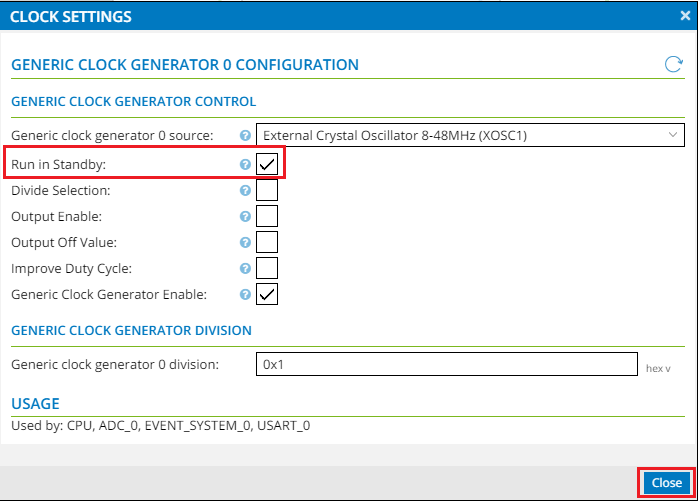 Configure RTC as an event generator to generate periodic (every second) events to the ADC through the 'Event System'. Enable RTC as an event generator. Click on the cog wheel , select 'EVENT SOURCES' as 'RTC COMPARE 0 (Compare 0 Event Output)' and close the window. Enable 'Channel 0' under 'CHANNELS'. Since event is triggered after the timer expires. No blocking calls, event system triggers the configured peripheral. 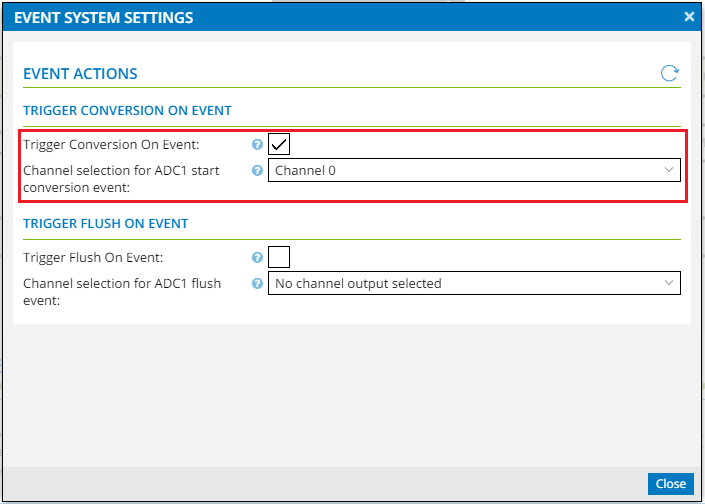 RTC is configured to generate event. Device will be in sleep mode, clock is enabled on demand whenever necessary. This configures trigger to start conversion when event occurs. This allows conversion to happen in Channel 0. All clock modules will be configured to run in standby mode, since all tasks or operations do not need CPU intervention. Click on the cog wheel of 'Generic clock generator 0'. Enable 'Run in Standby' and close the window. Click on the cog wheel of 'External Crystal Oscillator 8 - 48 MHz (XOSC1).